Deeply enriched by her knowledge of the teachings of G.I. 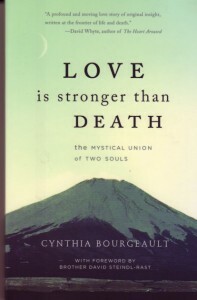 Gurdjieff and of Christian mysticism, this vibrant, provocative story adds a profound new dimension to understanding human love and the possibility of survival beyond the grave. This is a guidebook for those who are called to the path of conscious love. This powerful book, written by an Episcopal priest, tells of her intense relationship with Brother Raphael Robin, a Trappist monk and hermit. The romantic yet platonic relationship that ensued between the 50-year-old Bourgeault and the 70-year-old hermit lasted five years, until his death. Both believed that a relationship can continue beyond this life, and here Bourgeault describes her search for that connection before and after Robin’s death. $16.95 — Monkfish Book Publishing, 22 E. Market St., Ste. 304, Rhinebeck, NY 12572.